Deep Tissue Handheld Massager Just $19.50! Down From $99! You are here: Home / Great Deals / Amazon Deals / Deep Tissue Handheld Massager Just $19.50! Down From $99! Don’t miss this amazing deal from Amazon! Get this Viktor Jurgen Deep Tissue Handheld Massager for just $19.50, down from $99.00, PLUS FREE shipping for Amazon Prime or orders $25 or more! Are you suffering from constant neck, shoulder, and back related pains? Are you in search of a massage pillow that delivers deep reaching, 5-star massages? If yes, the Viktor Jurgen Deep Tissue Handheld Massager pledges to deliver that and much more. This massager has in-built 3D deep-reaching revolving three interchangeable massage nodes that relax tight muscles, relieve back and neck pain as well as increase blood circulation around the aching areas. The Viktor Jurgen Deep Tissue Handheld Massager was expertly designed to fit perfectly behind the contours of the neck, lower and upper back, abdomen, thigh, and calf areas, implying that absolutely no muscle in your body will be out of reach in the event of a full body massage. This is the best option fully suited for a full body massage! DEEP PERCUSSION MASSAGES: With the advanced deep tissue massage and infrared physiotherapy, this portable handheld massager relieves built-up muscles and improves blood circulation as it penetrates deep into those irritating knots on such body parts as neck, shoulder, back, legs and foot. PROFESSIONAL POWERFUL MASSAGER: Extremely Intense motor with up to 3,350 pulses per minute. 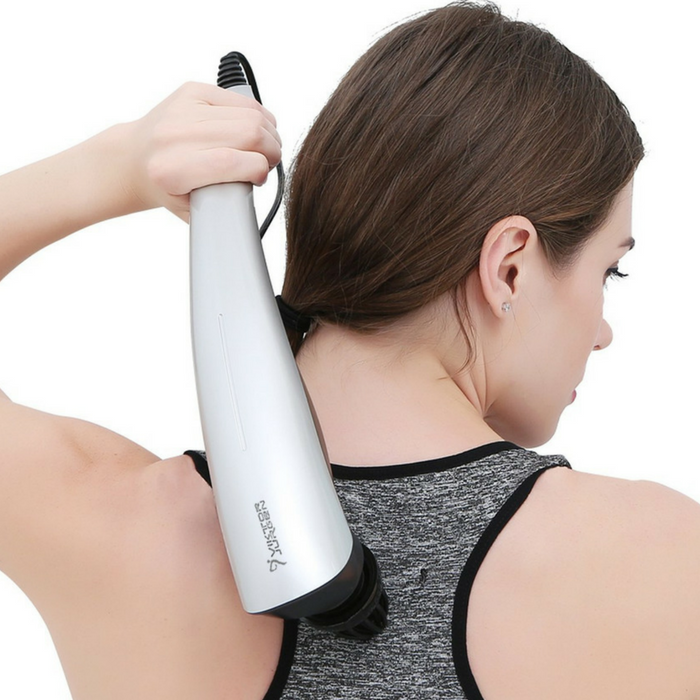 This handheld massager is FDA approved and quality assured hence it gives you a completely safe means to relieve neck, back or shoulder pains, and loosen tight muscles after a tiresome day. ERGONOMIC DESIGN: The long anti-slip handle and power cord (9.84ft) with streamline design make the portable massager easy to grip and helps easily glide the tissue percussion massager over different body parts.